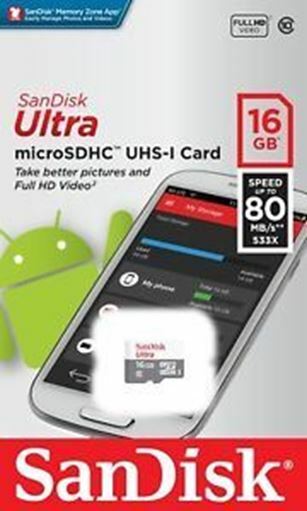 SanDisk Ultra® microSDHC™/microSDXC™ UHS-I cards are ideal for Android™ and other smartphones and tablets. Take better pictures and Full HD video with SanDisk Ultra microSD™ UHS-I cards1. Take advantage of transfer speeds of up to 80MB/s** to save time moving photos and videos from the card to your computer. With Class 10 video ratings you’ll be ready to capture high quality Full HD video (1080p). SanDisk Ultra microSD™ UHS-I cards are waterproof, temperature-proof, X-ray proof, shock-proof and magnet proof4 and come with a seven-year warranty3.